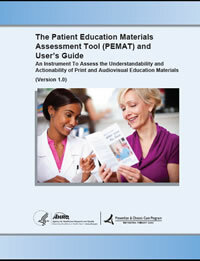 The Patient Education Materials Assessment Tool (PEMAT) is a systematic method to evaluate and compare the understandability and actionability of patient education materials. It is designed as a guide to help determine whether patients will be able to understand and act on information. Separate tools are available for use with print and audiovisual materials. Sarah J. Shoemaker, Pharm.D., Ph.D., Abt Associates, Inc. This document was produced under contract to the Agency for Healthcare Research and Quality (AHRQ) under Contract No. HHSA290200900012I, TO 4, "Improving EHRs Patient Education Materials." The AHRQ Task Order Officer for this project was Cindy Brach, M.P.P. The content of this document does not necessarily reflect the views or policies of the Department of Health and Human Services, nor does the mention of trade names, commercial products, or organizations imply endorsement by the U.S. Government. The authors assume full responsibility for the accuracy and completeness of the ideas presented. We would like to acknowledge the raters from Abt Associates, AHRQ, Massachusetts General Hospital, and Northwestern University who helped to establish the reliability of the PEMAT; Allyson Ross Davies for her guidance on instrument development; and Ken Carlson and Mark Spranca from Abt Associates for their valuable engagement with the reliability and validity testing of the PEMAT. We would like to thank the technical expert panel who helped to shape this instrument by providing guidance and feedback at critical points in the development process: Geri Lynn Baumblatt, M.S. ; Cynthia Baur, Ph.D.; Patricia Brennan, RN, Ph.D.; Darren DeWalt, M.D., M.P.H. ; Robert Mayes, M.S., RN; Michael Paasche-Orlow, M.D., M.P.H. ; Eva Powell, M.S.W., CPHQ; Dean Schillinger, M.D. ; Josh Seidman, Ph.D., M.H.S. ; and Paul Smith, M.D.